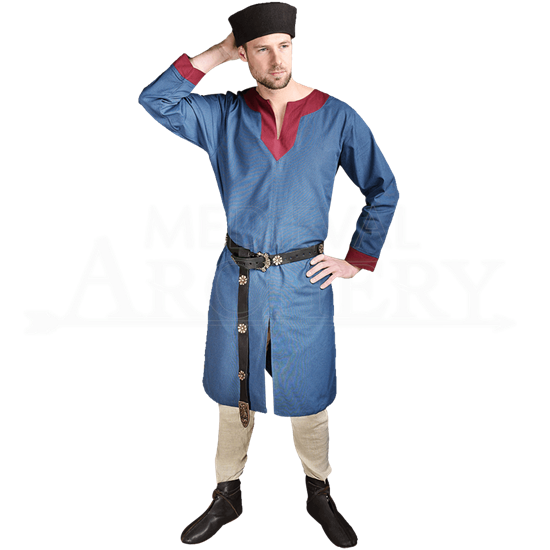 Whether your character is a pragmatic merchant, a medieval nobleman, or an adventurer of almost any sort, the Wilfred Cotton Tunic will have you dressed in distinct medieval style with its classic shape and cool color block look. Made of 100 percent cotton fabric, this versatile tunic reaches the knees on most wearers and has a slight flare to its shape. Slits cut in the front and back of the canvas tunic allow for ease of movement. The long, straight fit sleeves will keep out of your way while you undertake your next quest. Adding a dash of style to its essential structure, a bold line of contrasting colored fabric decorates the medieval tunics V-cut neck opening and sleeve cuffs. Uniquely stylish without compromising versatility, this cotton tunic suits Viking, medieval, Renaissance, and fantasy eras. Accessorize with your favorite leather belt, and you will be ready to take on your next historical reenactment event, LARP, or Renaissance festival.